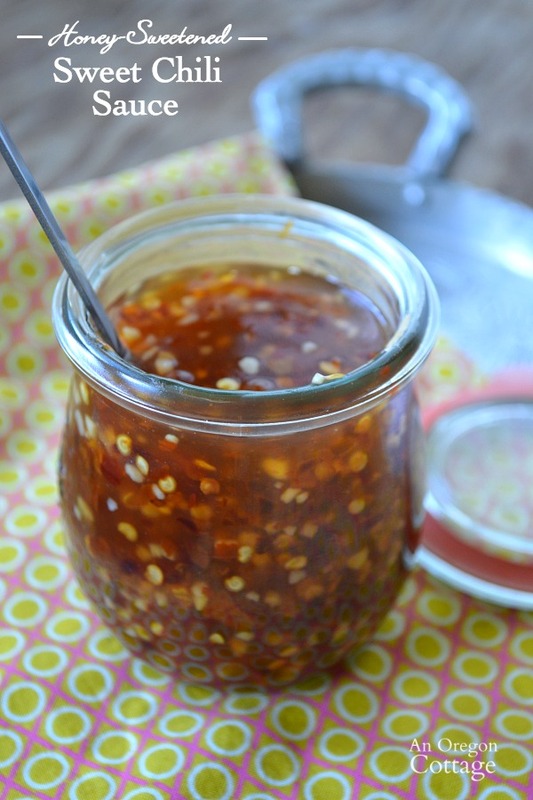 A spicy-sweet Asian condiment, homemade sweet chili sauce is easily made with dried chilis and sweetened only with honey. I’ve always loved, loved, loved Asian sweet chili sauce – it’s my favorite thing to top Chicken-Lime Lettuce Wraps, Stir-Fry Vegetables, grilled chicken, and much more as I’m sure you could guess. However, I’ve often felt a tad guilty because sugar is the first ingredient (hello, that’s probably why I like it! ), so I wouldn’t buy it very often. But then I’d be missing it. Ugh – the thought processes of healthy eating, right? 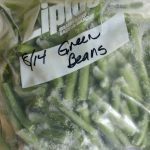 The other day I was creating a new slow cooker recipe to share with you (using chicken and our frozen, unblanched green beans – stay tuned!) and I just wanted sweet chili sauce to add to the other Thai-like flavors I had going on (fish sauce and lime juice…). But of course I didn’t have any. I hit the internet and discovered how easy it is to make homemade sweet chili sauce – and to be in control of the sugar content. Score! 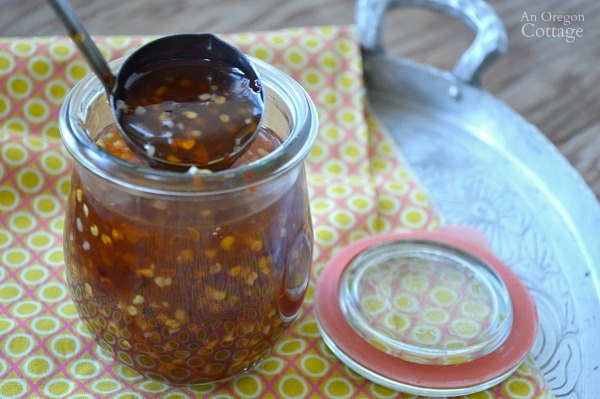 I didn’t have any fresh chilies, so I adapted this recipe to use dried chili flakes and to be sweetened with only honey – and just 1/3 cup in the whole batch! The result is still a spicy-sweet concoction, but now I can have it whenever I want–especially because it only takes about 5 minutes to make. Really! It’s a lot more inexpensive with the dried chilis, too. So, to recap: this homemade sweet chili sauce is quicker to make than buy, cheaper and able to make it healthier–that’s the kind of pantry basic recipe I love. Note: some have asked where to get the dried chili flakes – Amazon (my affiliate links) has a good price here for McCormicks and this is a great price for 1 lb. of organic chili flakes. You can also find them at Costco and in smaller jars at regular grocery stores spice aisles. 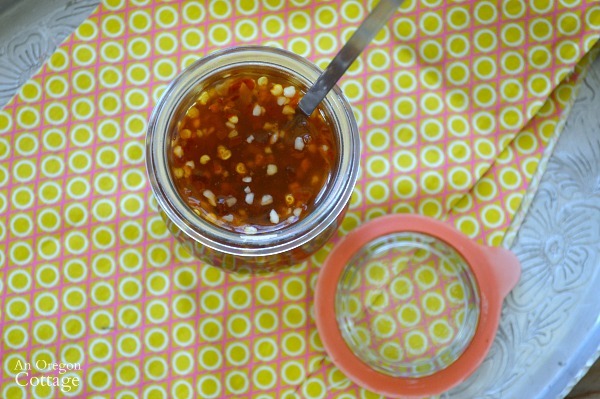 Click the arrow for the full chili sauce recipe (with print options)! We’ve had it for a month before using it up, but I think it would store longer than that even. I LOVE sweet chili sauce!!! I would make this, but change when you add the honey from the boiling stage to when it begins to cool in (under 100*) order to save the beneficial enzymes that are destroyed when heating. (otherwise, you might just as well use sugar!) I will make this soon! I usually just buy a large bottle that is pretty decent with regards to ingredients, but making my own is always better!!!! That’s a good suggestion, Carol – thanks! All I have is malt vinegar, could I use that?! 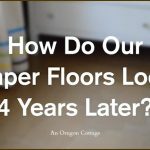 Could I use regular white vinegar? Yes. I just usually use rice vinegar with Asian dishes and it’s a lighter flavor. Where would you find dried chili flakes? I’m pretty comfortable in the kitchen but I’ve never seen them before. I just get them at Costco, but any supermarket should have something similar. Eeeek! So excited to try this! I just made this and it is delicious (and spicy- I added an extra teaspoon of chili flakes) !! Thanks for this great and simple recipe! I think you win the prize for first to make it, Michelle. 😉 Glad you liked it! This sounds wonderful – can’t wait to try it. Thank you ! !